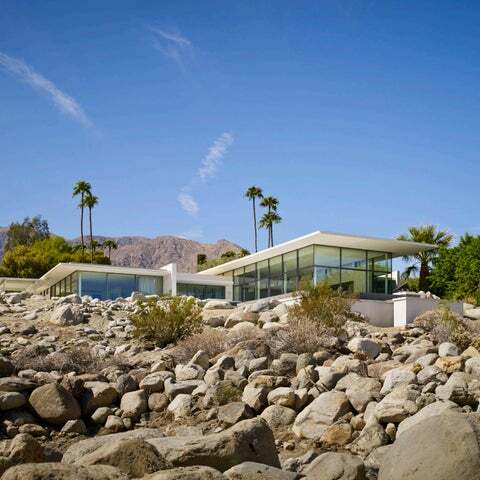 The Palm Springs House is nestled in a San Jacinto Mountain promontory that overlooks the Coachella Valley and mountain ranges beyond. The home pairs the dramatic views of the desert landscapes with the ownersâ&#x20AC;&#x2122; extensive art collection. Two offset linear masses linked by a sun-drenched kitchen contain living and sleeping spaces. This configuration creates courtyards that serve as extensions of the interior space. Operable glass facades bring natural light and ventilation into the house, while providing access to the outdoors. Deep roof overhangs and relocated olive trees provide shade from the harsh desert sun. The angular roofline is reinforced by the form of the infinity-edge pool. A solid wall provides privacy from a neighboring house, turning focus to the spectacular views that reflect off the glass and water. The centerpiece of the home is a forty-two foot long painting, stretching across the living spaces. Designed with the painting in mind, the clean lines and limited palette of the house were chosen to showcase the massive triptych. With smooth white walls and concrete floors, the interior finishes invoke the neutral backdrop of an art gallery. The project presented an opportunity to restore the native desert landscape that had been disrupted by lawn from a previous development. Local materials and labor were utilized extensively in the construction of the home. The house was created to reflect its surroundings and celebrate the landscape.